What's So Special About The Next Bejeweled? For some video gamers, December 7, 2010 is the world-stopping release day for the next World of Warcraft. There's another mammoth computer game coming out that day, a sequel you may not have thought you needed: Bejeweled 3. They're really making a new Bejeweled? Yes, PopCap Games, which put out the first Bejeweled in 2000 and Bejeweled 2 in 2004 is making a big deal about releasing this sequel. Six years is a long time between Bejeweled games, though this is more like Bejeweled 5 if you count 2008's Bejeweled Twist and 2009's Bejeweled Blitz on Facebook. Bejeweled 3 comes out on Tuesday, December 7 for about $20. So what are you doing this time, besides matching more gems? There's got to be more than matching gems, right? Actually, Bejeweled 3 is another gem-matching game. As with the original, you can spend seconds, minutes or hours matching at least three gems of the same color to each other in order to eliminate them and have the screen fill back up full of cascading gems. The new game's main attraction is that it has a lot of variations, including a poker mode, a time-based mode and even a mode that includes subliminal messages. What is that goblet at the top of this post? 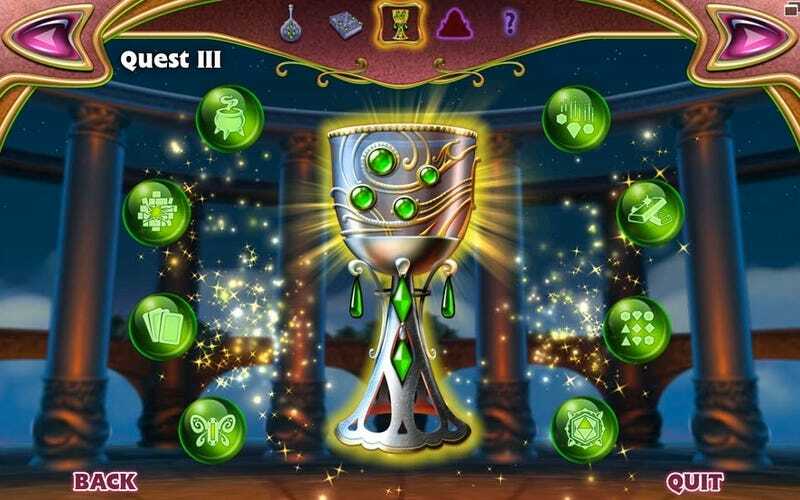 They've finally added goblets to Bejeweled? That's from the game's new quest mode, which presents a series of challenges like having to use gem-matches to dig deeper through the bottom of the playing field or having to somehow match gems to balance two weights. The idea is that instead of playing regular old Bejeweled — called "Classic" mode in this sequel — you could be taking on these specific Bejeweled missions in order to unlock... more missions. But what about the thing no one is asking for: Did they finally make Bejeweled with better graphics? Bejeweled is just about the last game that needs better "high-definition graphics" (why not make them in 3D while they're at it?). It's a fact that a new Bejeweled was going to look better than the last one, but it's also a fact that it probably doesn't matter to anyone who loves playing Bejeweled. The achievements system is a little more relevant, as it adds more of a rewards system for players who will be motivated by the goals of scoring X amount of points in Y mode. The new gems are more meaningful, but details on those will have to wait until the game is out and we can review it. Any multiplayer or iPhone or Facebook for this game? It doesn't look like it, not at launch. Bejeweled 3 is coming out first just for Windows PC and Mac. Given how Bejeweled games eventually go everywhere, expansions to other platforms seem likely. (PopCap estimates that they've sold 50 million copies of Bejeweled games and that the games have been played by 500 million people. Who knows how they counted this, but doesn't it seem like every other person has played this game?) For now it looks like Bejewled 3 will just be a game you pay for and download on your computer. We've asked about a free version, but so far PopCap is only showing the $20 one. PopCap says they'll offer a free trial version for download on December 7 in addition to the $20 full downloadable one. Check back on Kotaku on December 7 for our Bejeweled 3 review.